Risk management for novel development, engineering development, high complexity, new product development, new ventures, and large capital projects demands new and more robust methods to effectively deal with high uncertainty. Prior posts explored varieties of uncertainty and design strategies, facing innovation uncertainty, and technical risk assessments in new product development. Since most development and innovation work are managed as projects or as a subproject within a large project new methods to manage high uncertainty that integrate within existing project management and project risk management approaches would be useful. This post reviews a book Managing The Unknown: A New Approach to Managing Uncertainty and Risk in Projects written by Christoph Loch, Arnoud DeMeyer, and Michael Pich in 2006. 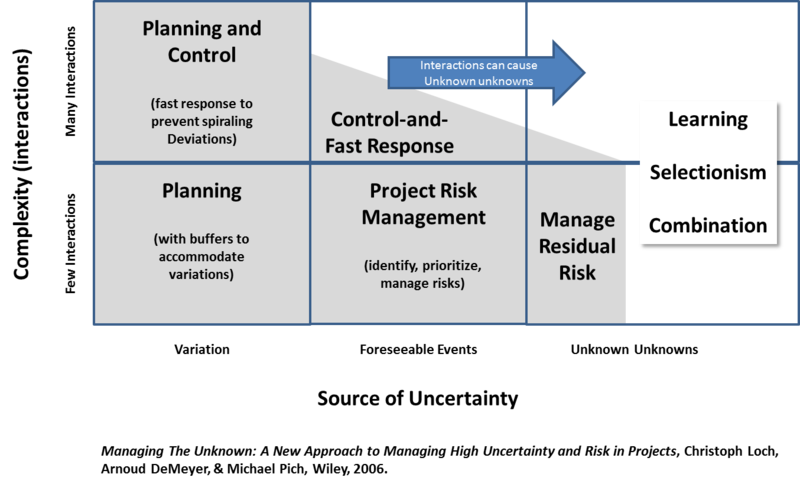 The authors present an integrated project risk management framework that assists project management to select project risk management methods based on the sources of uncertainty and complexity as shown here. This framework is useful because it integrates existing and well understood project risk management methods with new methods for managing uncertainty like learning and selectionism. The source of uncertainty axis maps well into the uncertainty continuum concept of a previous post. The authors use an uncertainty continuum breaking uncertainty into foreseeable and unforeseeable uncertainty. Foreseeable uncertainty includes variation and foreseeable events while unforeseeable uncertainty includes unknown unknowns. These distinctions are enough to provide a decision tool to select appropriate risk management methods. The project risk management framework requires project management to determine project complexity. Another useful approach described in the book is a method to measure the project complexity. The authors base their approach on the number of interactions between major parts of the project in three domains: system domain; project task domain; and organizational domain. The authors apply the Design Structure Matrix (DSM) tool to model and visualize how major project pieces interact. Methods are proposed to simplify the measurement process to give quick / high level results for large projects. 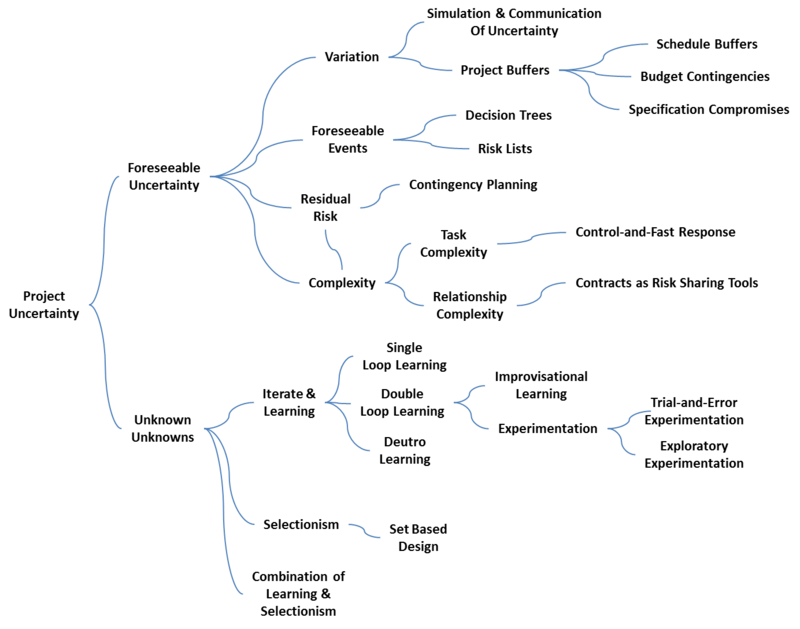 Complexity is then computed based on the sum of all project elements multiplied by the sum of all interactions. No comparative complexity measure results are presented for project types, industries, etc leaving each firm to develop their own benchmarks from amongst their own project portfolio. Break the overall problem into pieces. For each piece, perform risk identification, identify knowledge gaps by probing assumptions in an iterative way. Estimate the complexity of each project piece and the overall project. Manage pieces in parallel pieces according to the project risk management framework above. To visualize the uncertainty and complexity of each major piece the authors propose a pie chart for each piece with a bar for: variation, foreseeable uncertainty, unforeseeable uncertainty, and complexity. These pie charts can be used to decide where additional attention is required according to the project pieces and can be used to capture trends over the project life. The book also describes a broad set of project risk management methods with an excellent set of examples and case studies from many industries. The project risk management methods are summarized here. In the case of a learning approach the authors explore improvisational learning and experimentation. For selection the authors explore what makes selectionism work and offer set based design as an example of how to implement it in practice. Guidance is provided on how to implement these methods and good case examples are provided. Overall, this book provides a useful project risk management framework and decision tool that can be applied in practice for a more robust project management and risk management system when high uncertainty is present. Effort would need to be planned for and budgeted for in the project which suggests that the approaches would need to be applied on several projects to collect historical basis of estimates. The authors provide a number of methods to address unforeseeable uncertainty but additional methods could be added to this decision tool such as real options, big data, adaption, and creaction reported in prior posts. The book provides a practical method to measure project complexity which is often difficult to measure and benchmark. Anyone assigned accountability for projects with novelty and complexity should read this book. This entry was posted in Derisking, Managing Uncertainty on August 23, 2013 by Andrew Reif.